Some fish are natural nippers, such as barbs and cichlids, but when housed together in large groups, pose no real threat to each other. Introduce an unsuitable fin-nipper to a peaceful aquarium containing fancy goldfish, guppies or angel fish and you will have to remove the aggressive fish before it wreaks havoc with your other fish's fins. Research fish species and behavior before setting up a new aquarium or adding to an existing community tank, or you could end up with a tank full of frayed fish. Remove the offender immediately before it does further damage to the rest of its tank mates. If a fish is naturally aggressive, no amount of hiding places and plants will deter it and your other fish will suffer from stress keeping out of its way. Leave a fin nipper in a community tank and it will work its way through the whole aquarium leaving you to deal with the resulting casualties. 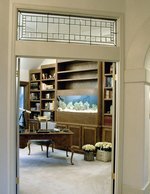 House the fin nipper in a separate tank or find a new owner if you are unable to give it a tank of its own. In a worst case scenario, return the fish to the pet shop and explain your problem. Pet stores are more likely to take back a fish than see it come to harm, however, you may not get your money back. Treat injured fish with a fin rot solution to heal nipped fins and prevent infection. Open wounds attract bacteria and can quickly turn into a case of fin rot when fish are stressed. If an aggressive fish is chasing a passive fish and nipping at its tail constantly, it will become stressed. Even when the nippy fish is removed, the bullied fish will remain scared and susceptible to disease if you do not treat its wounds. Prevent the problem occurring by carrying out effective research into the varieties of fish that you intend to put together. Never house aggressive species with long-finned species. If in doubt, use an online virtual fish tank creator such as thinkfish.co.uk. 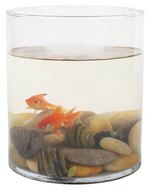 This handy tool warns you if you are putting unsuitable fish together before you make a purchase and offers alternative choices for a completely compatible aquarium.